It's hard to believe that Summer Preschool has finished for 2010. This week's theme was health and fitness. Monday, we learned about the importance of rest. We talked about bedtime routines and did some sequencing activities. Sorry we don't have pictures but you can print out the Blue's Clues bedtime routine cards that we adapted. Tuesday and Wednesday were about exercise. Miss Lindsey taught a fun dance to You Are Good by Israel and New Breed. As you can see from the blurry photo, the kids got a lot of exercise. The children exercised their fine motor skills with a baseball lacing project. The satisfaction of a job well done. 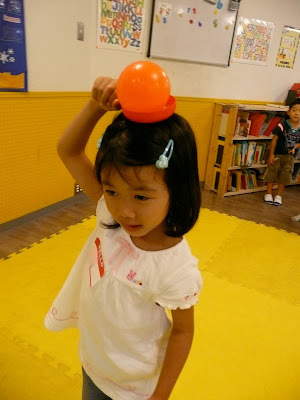 We ran our own egg and spoon race, substituting a ball and toy frying pan. We also exercised outdoors with a tug-of-war, bucket relay and jump ropes but the camera didn't find it's way outside. Thursday was about hygiene. Children made their own "Clean and Healthy" books. They got germs (glittery powder really) all over their hands and learned how to wash their hands thoroughly. 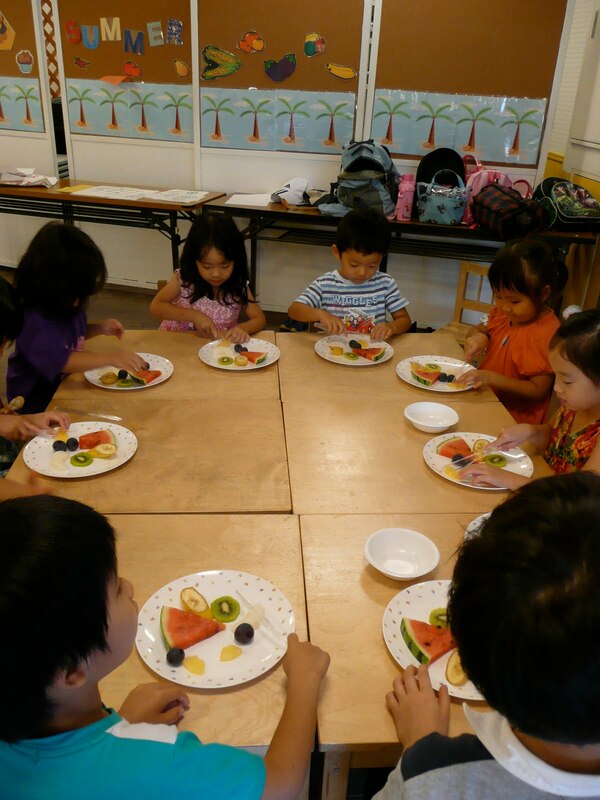 Friday was nutrition day. We read Eric Carle's Very Hungry Caterpillar which teaches about (among other things) healthy and moderate eating. 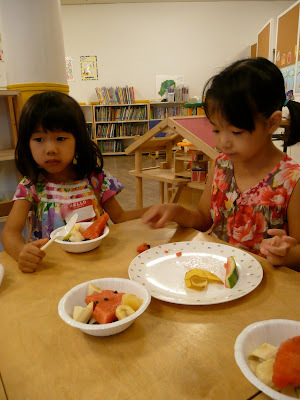 Later, the children listened to the Wiggles' Fruit Salad and made their own fruit salad. They were proud to "cook" their own food. 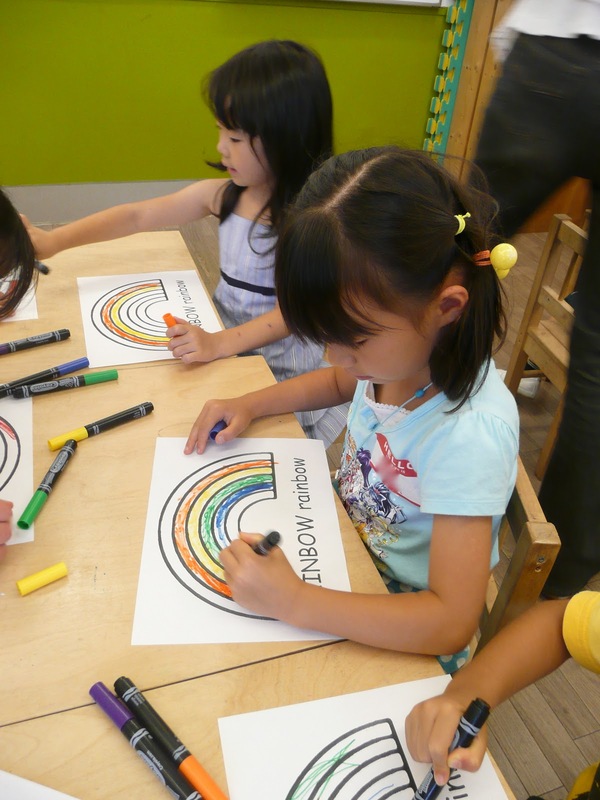 In all, it was a wonderful month of summer school. I'm full of gratitude to the children, parents, and staff who made it possible. 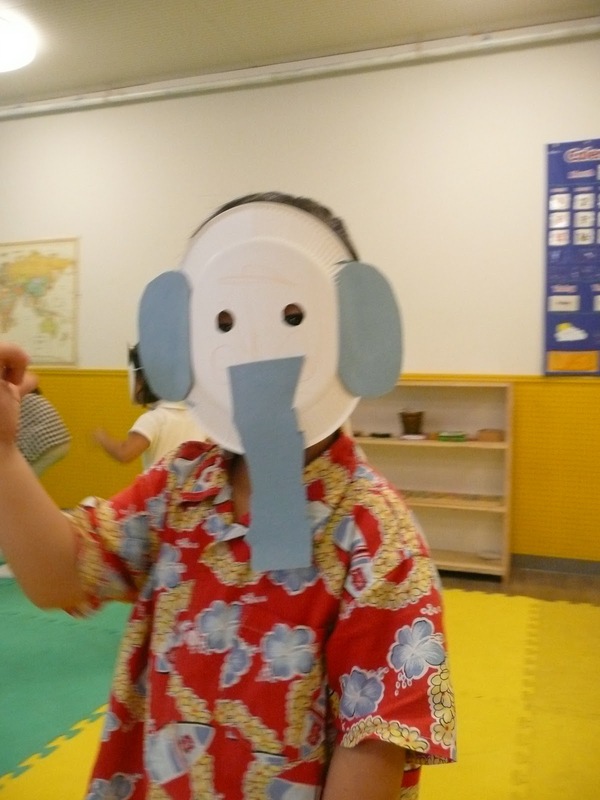 This week's summer preschool theme was "Going to the Zoo!" 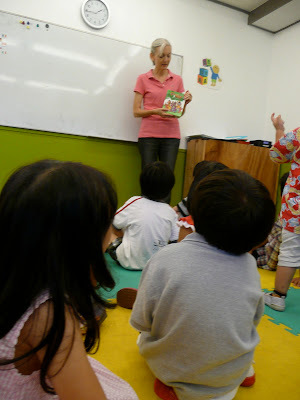 We began with Eric Carle's Polar Bear, Polar Bear, What Do You Hear? and listened to recordings of the animal sounds featured in the book. We made play dough from a recipe and shaped it into zoo animals. We read Curious George Visits the Zoo, did some monkey games and played with balloons. We read Eric Carle's From Head to Toe and got a good workout mimicking all the exercises the animals do in the book. We used blocks and little animal figures to make our own zoos. The boys below are working on the aquatic part of their zoo. We made paper bag zoo-animal puppets (which we unfortunately don't have pictures of). We read about Elmer the patchwork elephant and made our own "Elmers" by dipping paper towel wads into paint and applying it to elephant outlines. We read Eric Carle's 1,2,3 to the Zoo: A Counting Book , (can you tell we're big Eric Carle fans?) and counted and sang along with a song that a friend wrote to go with the book. 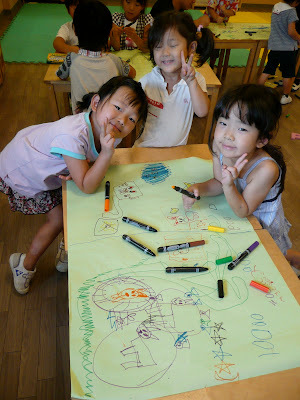 We made small groups and collaborated to design and draw zoos on big pieces of paper. And between all the zoo activities, the children had a chance to eat lunch together, play some games, have Bible time, learn a dance and play at the park. What a fun and busy week! 1, 2, 3, 4, 5, 6, 7, 8, 9, 10, 11. Later in the afternoon, children wrote letters home, stamped and sealed the envelopes and we sent them in the real mail. I hope you've received the letters by now. Please stay cool somehow on these hot days and enjoy the week off. Today's Summer Preschool Community Helpers were firefighters! Children went outside at park time to find a raging inferno (or at least chalk drawings of fire on rocks)! 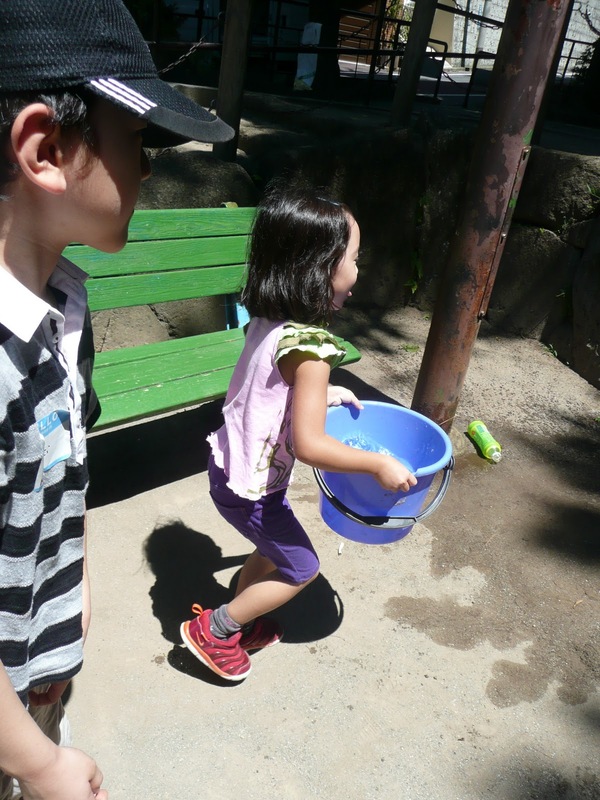 The quick-thinking students filled buckets with water, ran to the fire, . . .
and extinguished it in the nick of time. Back inside for gym class, there was a firefighter obstacle course with ladder walking, fire jumping, and flaming hoop diving. After Mrs. Ellen's Bible lesson about the fifth day of creation, children sorted animals into things that fly in the sky and things that live in the sea. I like that the flying fish is in the sky. 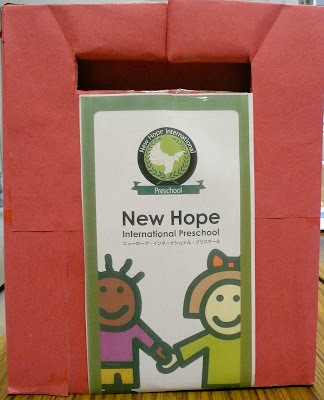 A few more pictures from "Community Helpers" week in summer school. Working on his police badge. What color shall we make our trains? This bug was in a boy's lunch today. Just so you know, he ate the legs first, then the head, then the rest of the body. In the first day of summer preschool our activities all related to doctors and dentists, today's community helpers. Children bushed with toothbrushes and toothpaste (white paint) to make a yellow tooth shiny and white.